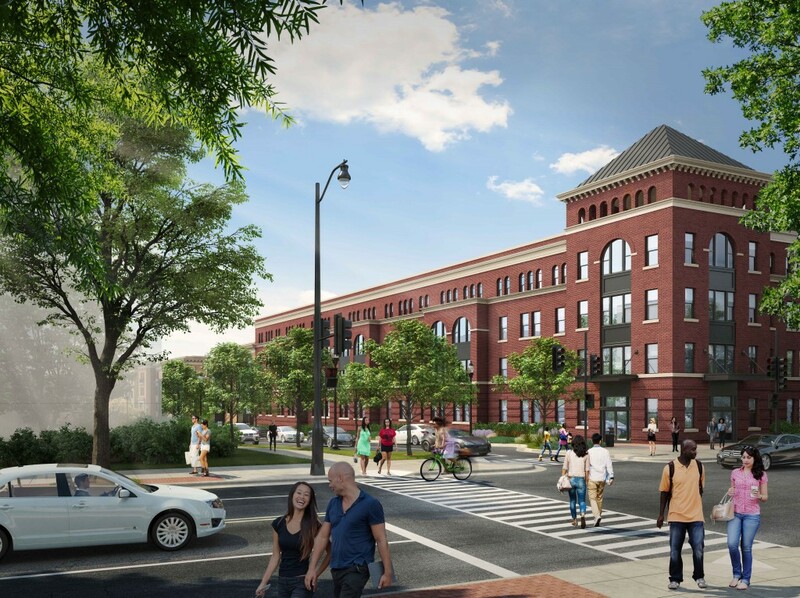 Today, MidCity Development proudly submits its application for second-stage review and approval of a Planned Unit Development and modification to an approved first-stage order to the D.C. Zoning Commission (“Stage Two PUD”). The Commission approved the first-stage PUD to which the application succeeds by Order No. 14-18, effective as of November 6, 2015. “We needed to amend our original plan for Block 7 which included two-over-twos to accommodate on-site resident relocations and to build more replacement housing at an earlier stage. We said we would build affordable units first, and we are doing just that. We feel this Stage Two PUD is proof of our commitment to preserving affordable housing and making sure this process is supportive of our current residents”, says Michael Meers, Executive Vice President. The Family Building design boasts significant ground floor amenity space, including a pool and lounge deck. Similarly, the Family Building roof is designed with families with children in mind including an “open lawn” feature, community game space, and outdoor grilling and eating facilities. The proposed design includes large floor plan units (up to 1,400 square feet) to accommodate families of various sizes. The Senior Building, which will be occupied by Section 8 residents sixty-two years and older, is thoughtfully designed with an aging population in mind. The design includes extra entrances and elevators to maximize residents’ ability to connect with others in their building and the larger RIA community. The Senior Building includes a handicapped accessible Japanese style “zen” garden as well as significant amenity space allocated for future health and wellness programing to support the needs of residents. “My grandfather, Eugene Ford, Sr., was adamant that you should never be able to discern affordable housing by building design or maintenance – he wanted very much for subsidized housing to feel “market” and we have achieved that ideal with our design here,” says, Madi Ford, Director of Legal Affairs at MidCity. 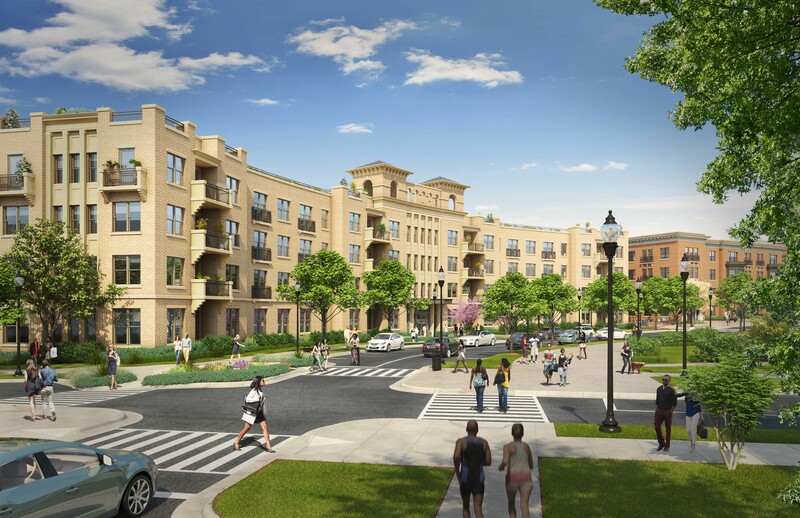 This is the first phase of a multi-phase project that will ultimately include up to 1,760 residential units and up to 181,000 square feet of commercial space to include an approximately 55,000 square foot full service grocery store and other neighborhood serving retail. 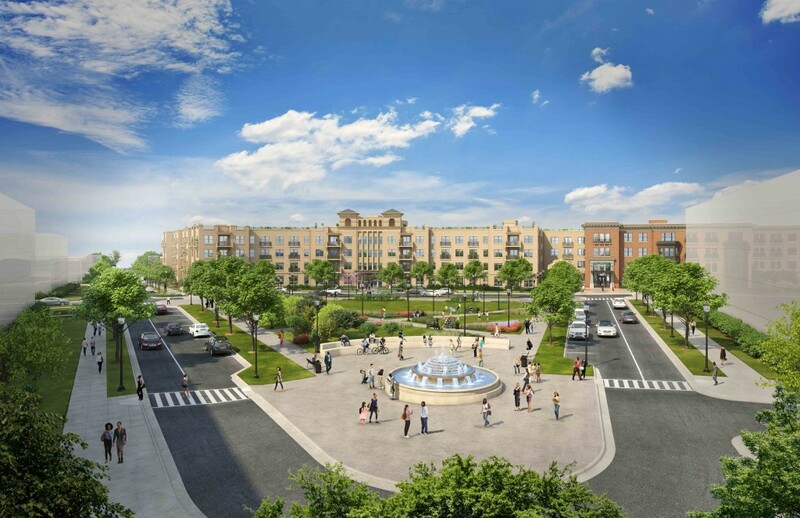 The project will also provide for a 0.9-acre community green and a 0.5-acre pedestrian plaza as well as a new, highly connective street grid that includes the introduction of new streets. Retain the Section 8 contract that assists 373 very low income families. Provide 22% total affordable housing units versus the requirement of 8%. Provide the opportunity for all residents to remain in the community. Build replacement affordable housing first. MidCity, with support from agencies, officials, neighbors and residents, will collectively build an inclusive community with economic diversity and opportunity for all.